Episode 5 already. Damn, so many collaborative tools for designers. Yes. And this post is about the one everybody talks about, but what they are actually referring to is something else: Adobe Creative Cloud. Let me rephrase that. 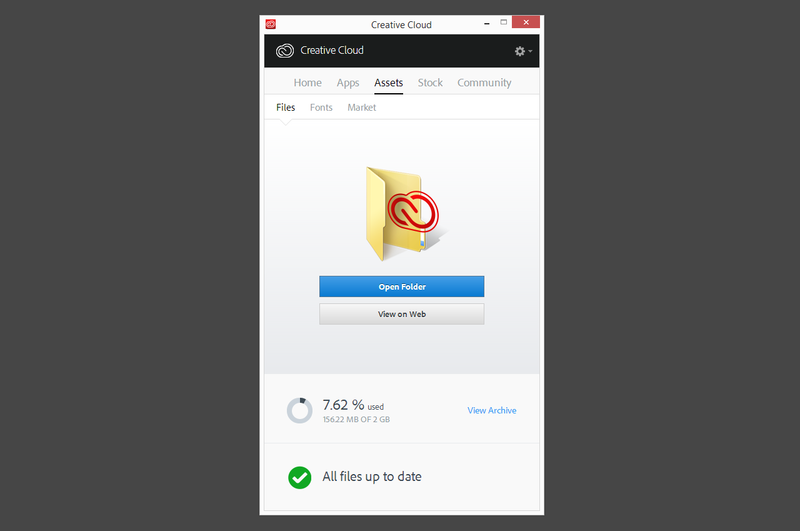 When you tell people you are trying out Adobe’s cloud, they think you are using Photoshop or something. They don’t picture that what you are actually studying is the file hosting and syncing with Adobe’s servers. You know, the thing that works like Dropbox. Well, unless I’ve badly searched in the giant list of Adobe’s applications, the only tool they advertise doing collaboration and versioning, is Adobe Creative Cloud. Yes, the syncing app with the “real” cloud. No, not Photoshop. Your files, on their computer. You get it. And don’t tell me it’s called Adobe Version Cue. Has anyone ever used this? I tried. A long time ago. And did not manage to make versions of my files with it. So I abandoned. And so did Adobe. As I flew away from Adobe products since the first Creative Suite versions, I really thought that people were actually using the “cloud” services from Adobe, so I was surprised to hear none of my friends were actually using the 2Go of “free” hosting offered with their subscription. So to complete this review, I asked some friends if they wanted to test it. 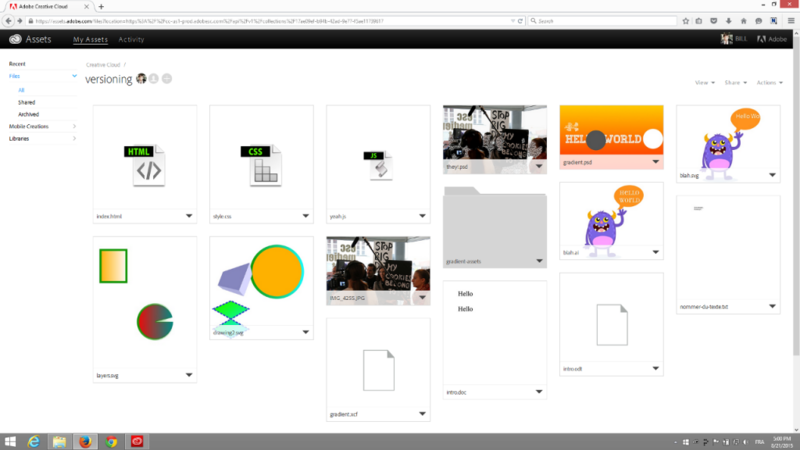 Sébastien Monnoye, teacher and designer, who also had never pushed files on the Creative Cloud before, answered the call and we started sharing folders together and explore the tool. One thing for sure, and you guessed it, is that it treats Adobe’s file format very well. The rest, not that much. 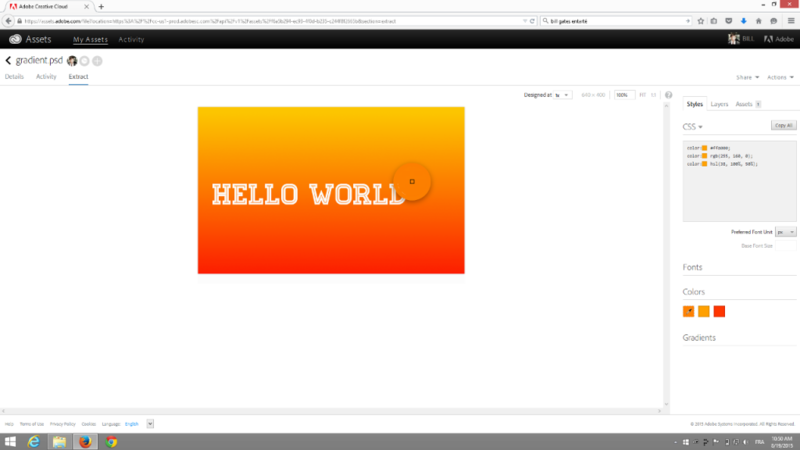 You can, of course, see a preview of .psd and .ai files in the browser. But you can also break down that preview by turning on and off the individual layers for those files. Neat. With a click of a button you can extract certain elements from a .psd or a vector file and add them to a library of assets. These libraries are accessible right from inside Photoshop or Illustrator. So you could just drag and drop from those into a new design. It really speeds up the reuse of certain elements you might have made in your previous projects. (They also propose to buy and download existing libraries of assets. But I did not look into that too much or how you could submit your own designs.) And lastly, for all the elements in a design that you can select, they show you what are the CSS rules you need to write to have that same element behave the same way in a web page. Kind of nice. Especially for positioning. So, for every (adobe) file you upload, you can see some meta data, quickly access the major colors present in the design, leave comments for collaborators, extract assets, share the design on Behance and see the previous versions of the file. But don’t expect a reliable versioning system here. After 10 days, old versions are trashed. After 10 days, we delete the past versions from the servers. If you know a version is going to be important, we suggest you make a copy of the current file you’re working on and save it with a new name. Then restore the original file back to the revision you care about. This way both copies become their own unique file that won’t be deleted automatically. 10 days is… ridiculous. And the solution proposed here kills all the benefits of using a versioning system. So let’s call this a short term memory backup, shall we. Nothing more. Why would you want to come back to a previous version of a design after 10 days, right? Anyway, now on to the weird parts. In the little application you install on your desktop, you get real-time notifications when a collaborator leaves a comment, but they don’t tell you which file has changed and who did the changes. So apart from the comments, the app is just there to do the syncing and let you access the Adobe market for apps, fonts, stock photos and assets libraries. You can also see a preview of what’s trending on Behance. (Mmmh actually, there is a way to see which files have changed, but good luck on finding where that is. Tip: it’s not in the notification window.) So to sum it up, this is more like a market place for the Adobe products than a tool to communicate and collaborate, as I thought it could be. I’ve only tested graphic files. More tests could be made with InDesign files, Premiere, After Effects or Flash. But I’m kind of focusing from a web designer point of view. So I also tested some other file types: .odf (Libre Office), .xcf (Gimp) and .py (Python) and unsurprisingly, they are all treated as blobs. With SVG, it’s a special case. They all are rendered correctly, but the features you can have with them are very different if you have saved them from Illustrator or from Inkscape, for example. The latter having the less feature, of course. To wrap up, I’d say that the tool to extract assets is really a nice productivity improvement, but the syncing and collaborative features are behind what Dropbox is proposing. And since Dropbox just acquired Pixelapse, they really aim at offering an even better experience to designers, if they are not the tool of choice in that field already. Adobe is forcing its tool on everybody, of course, because you need that little app to install the Photoshop and others, but they need to polish it a lot more to get the designers to give them their files. And I don’t think that the “Publish on Behance” button is really a key here. But lets see how that evolves over time.